Today we are going to talk about the list of the best freeware programs for remote access and desktop control. We are talking about remote administration tools for Windows 10, 8 and Windows 7. What may you need such programs for? In most cases, they are used for service purposes by system administrators. However, from the standpoint of a regular user, remote control of a computer via the Internet or a local network will be also useful. For example, you can connect to an existing PC instead of going through the whole city to help your friend. TeamViewer is probably the most famous program for remote control. It is easy to use, has support of many languages, very functional, works great over the Internet, and is free for private use. In addition, it can work without installation on a computer, which is useful if you only need a one-time connection. TeamViewer is available as a full program for Windows 7, 8 and Windows 10, Mac and Linux, which combines server and client functions and allows you to set up permanent remote access to a computer. The good is that TeamViewer QuickSupport module does not require installation. It shows Startup ID and Password screen immediately after the launch. 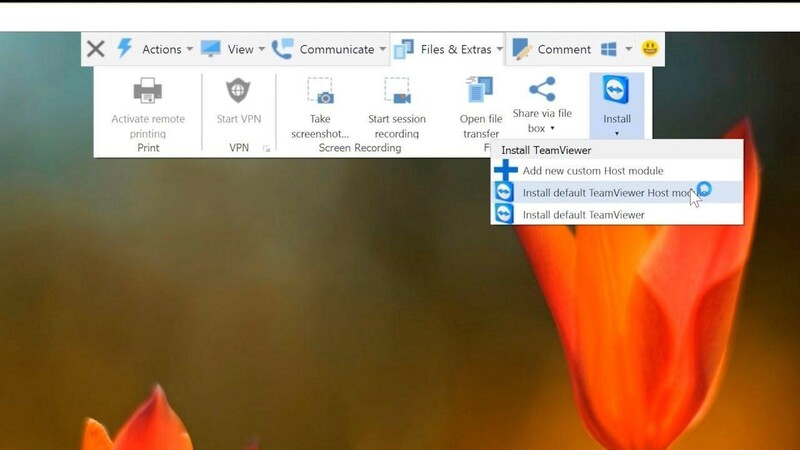 Additionally, there is the TeamViewer Host option to provide connectivity to a specific computer at any time. Furthermore, TeamViewer applications for Chrome and applications for iOS and Android are already released. Supports Wake-on-LAN (switching your PC on remotely), reboot and automatic reconnection in safe mode. 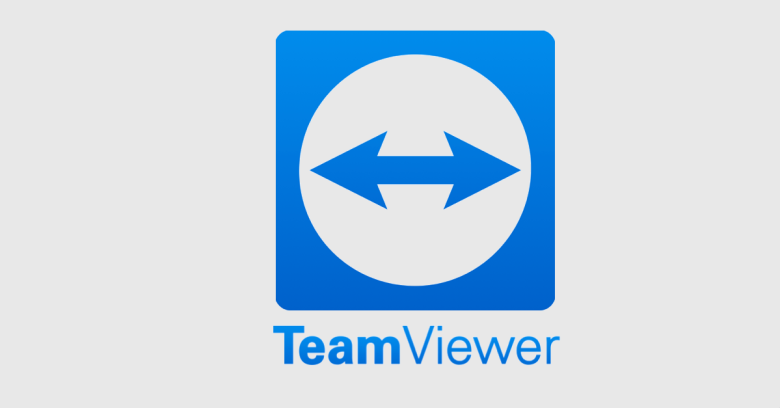 To summarize, TeamViewer is an option that we could recommend to almost everyone who needs a free program for remote desktop and computer control for domestic purposes – everything is intuitive and easy to use. For commercial purposes, you will have to buy a license (otherwise you will encounter the session termination automatically). 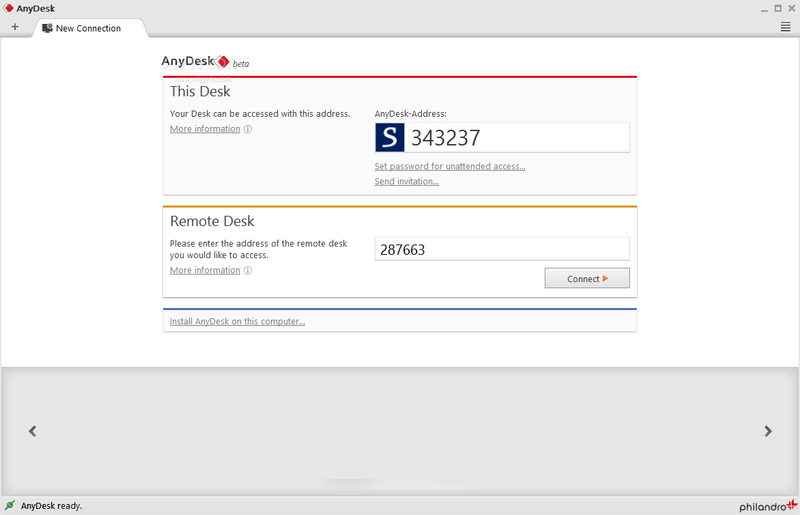 AnyDesk is another free program for remote access to a computer that was created by former TeamViewer developers. Among the advantages – a high speed of transfer graphics compared to other similar utilities. The functionality is not so rich compared to some other remote administration tools. However, AnyDesk supports many languages and file transfer, connection encryption, the ability to work without being installed on a computer. In other words, the program has all for the use of the remote desktop connection “for work”. There are versions of AnyDesk for Windows and for all popular Linux distributions. Versions for Mac OS X, iOS and Android are promised. 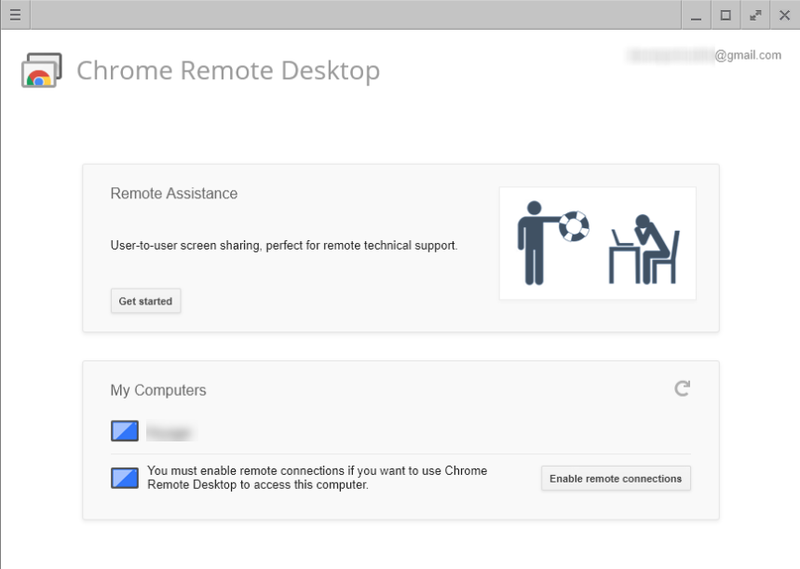 Google has its own implementation of a remote desktop, working as an application for Google Chrome (in this case, you will not only access Chrome on a remote computer but the entire desktop). The app supports all computers where you can install the Google Chrome browser. There are also official clients in the app stores, For Android and iOS. 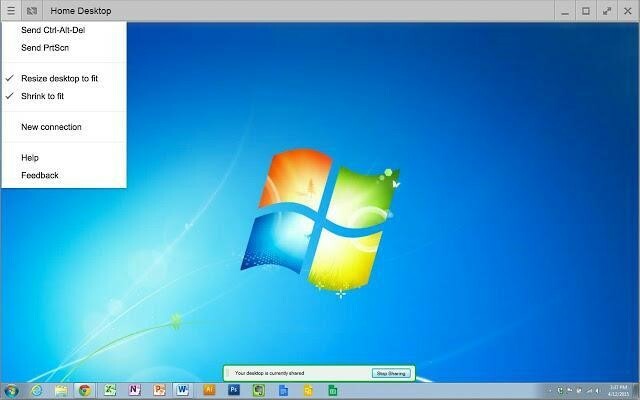 To use Chrome Remote Desktop, you will need to download the browser extension from the official store, set pin code, and, on another computer, connect using the same extension and the specified pin code. At the same time, to use Chrome remote desktop, you must log in to your Google account (not necessarily the same account on different computers). Talking about the advantages we would name the high-security level and the absence of additional software installation if you already use the Chrome browser. Among the shortcomings – limited functionality. Microsoft’s remote desktop is good because there is no need at the installation of any additional software for using remote access. Furthermore, all the data is adequately protected and works well while accessing another computer. However, there are some drawbacks. First of all, while you can connect to a remote desktop without installing additional programs, you cannot connect to a computer which version of OS lower than Windows Pro. 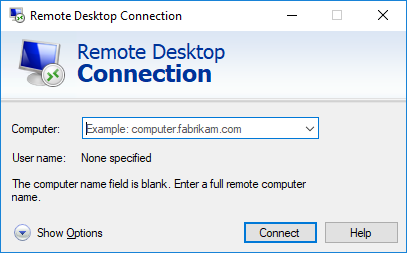 Another problem is that Microsoft remote desktop connection works only if computers and mobile devices connected to the same local network (for example, they are connected to the same router for home use) or have static IP. If you want to go beyond this limitation, you will need much time and efforts to tune appropriate settings which might be complicated for the ordinary user. In addition, you need to grant your computer credentials to a person accessing your computer, so you either need really trust the guy, or change the login\pass every time once you get a remote help. 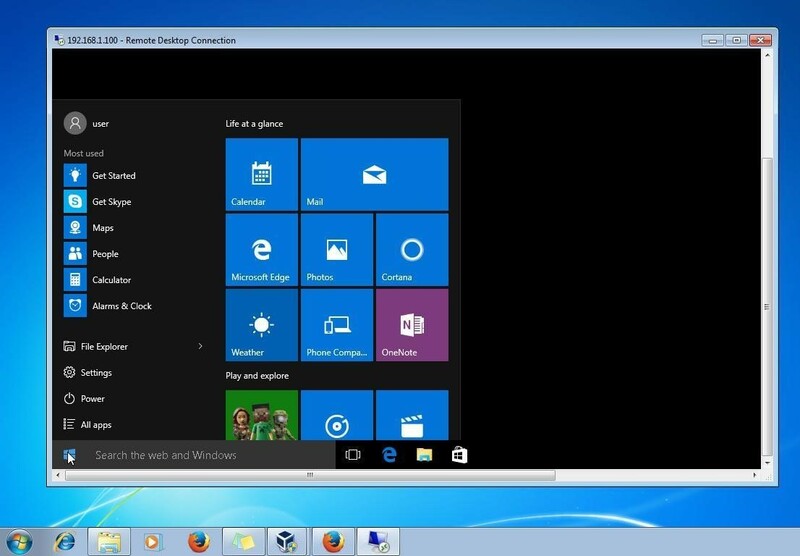 However, if you have Windows 10 (8) Professional or Windows 7 Ultimate installed on your computer, and access is required only for home use, Microsoft Remote Desktop may be an ideal option for you. Remote Utilities is one of the most powerful programs for remote access to a computer – it is free to manage up to 10 computers, even for commercial purposes. Several connection modes, including support for connecting RDP over the Internet. Remote installation and software deployment. 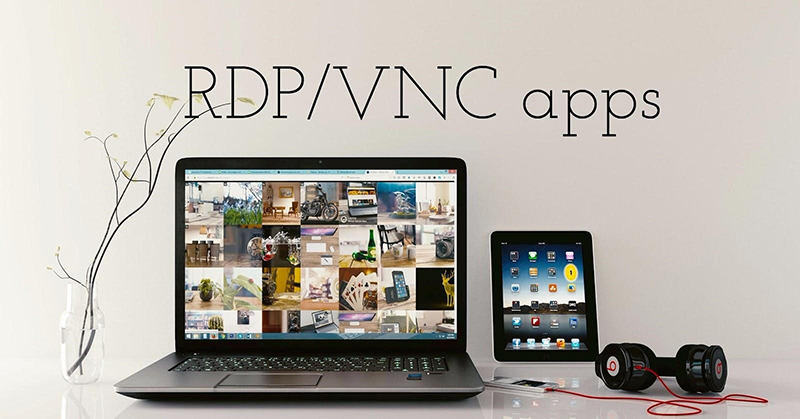 Access to a video camera, remote registry and command line, support for Wake-on-Lan, chat function (video, audio, text), recording a remote screen. Drag-n-Drop support for file transfer. These are not all the features of Remote Utilities. If you need something truly functional for remote administration of computers and for free, this option will be great. 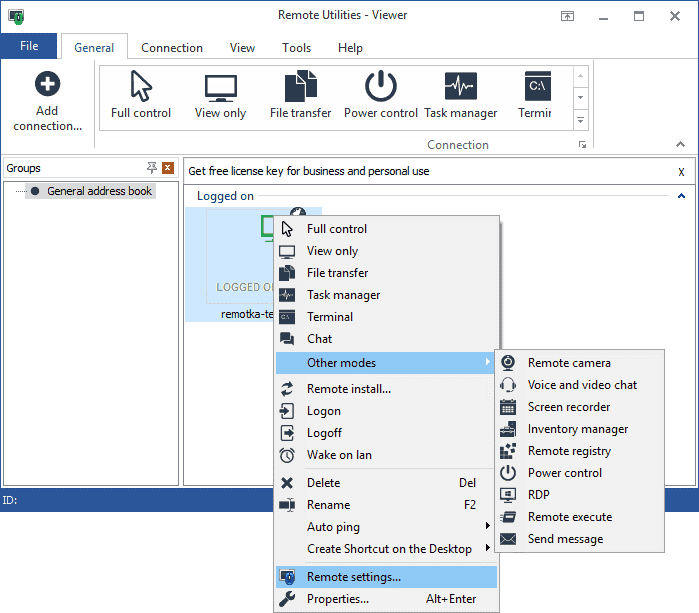 There are many more different implementations of remote desktop access for computers with different operating systems, both free and paid. Among them – Ammy Admin, RemotePC, Comodo Unite, etc. We tried to highlight those that are free, functional, and do not cause pain in the neck for antiviruses. Try these programs and leave us your feedback. Take care!